People always confuse disruption with innovation. Innovation is evolution, whereas disruption is revolution. Innovation makes the old ways better, whereas disruption makes the old ways obsolete! But most importantly in business, innovation allows you a 10% growth while disruption allows you a 10X growth. We’ve already seen two technological revolutions in our lifetime that have caused major disruption – the internet and the smartphone. And thanks to the digital revolution, disruption is now happening more frequently and at a faster pace than ever before. So we’re going to experience more disruption than previous generations ever did – disruption that will revolutionise business models and industries in ways that we can’t yet imagine. So who will disrupt the automotive/tyre industry? In our industry, the last major disruption was the introduction of the motor car in the early 1900s. How many horse and carts do we see on the streets today? Clearly, the car disrupted the horse and cart out of commercial existence. So now our old school, white, male-dominated industry is ripe for disruption and trust me (from the startups that I see as a venture capitalist), it is coming sooner than we think! And moreover, I can tell you that it will not happen as a result of the legacy manufacturers making better tyres, improving distribution systems or selling tyres on the internet. Like in every other industry, disruption in our industry will come from the outside. Look at the mobile phone industry – Nokia were undoubtedly one of the most innovative companies and arguably the industry leaders in this technology, yet in the space of just a few years, Nokia’s reign was well and truly ended. And this happened because of one reason – disruption, which Nokia just didn’t see coming. Because while Nokia had their eyes on their competitors, Apple came and ate their lunch! Let’s look at the medical industry for another example – CRISPR/CAS9 – (the genome editing tool that will enable scientists to weaponise human cells against cancer) could potentially be a cure for cancer and would ultimately disrupt the medical field. Where did this come from? You guessed it – from outside the medical field. Every industry has such examples! So who will disrupt our industry? Some industry observers say that Zenises (along with Alzura) is well on its way to disrupting the industry, being the first company in the world to offer tyres as a service across the internet. To those people I argue that what Zenises has done is definitely innovative but not disruptive. To understand disruption in our industry, we really need to understand not just what we do but why we do it. What we do is sell tyres and if we see our industry from that narrow perspective then Zenises is disrupting it. But if we understand the reason why we do what we do, which is to provide mobility, then we can see that we are merely a small fragment of a much larger industry. From this position, we can see that there are many more companies and individuals that have the potential to disrupt our industry. So disruption in the industry could come from the company making flying cars – if that ‘takes off’ and we end up living in a world like ‘The Jetsons’, tyres would become obsolete. Or disruption could happen as a result of tech companies taking virtual reality technology to a level that it negates the need for travel. Perhaps the companies creating personalised drone transport could disrupt the industry, or maybe it will be a company that works with a combination of these technologies or different technologies altogether. Such companies may sound futuristic but they already exist, and two of them have even received investments from our venture capital fund. My idea here is simply to get my colleagues to start ‘thinking outside the box’ and seeing beyond our industry, as this would perhaps enable them to come up with their own ideas for disrupting it. So what will the Apple or CRISPR for the tyre industry be and how will it work? I don’t know, but you can count on it that there’s a 14 year old kid somewhere outside the industry figuring it out (hopefully one whose company I have already invested in)! Of course, there are some drawbacks; In 2015, hackers worked out how to cut the transmission of a Jeep being driven at speed miles away — sparking a recall of 1.4 million cars. Autonomous vehicles will need a high level of connectivity in order to detect each other: vehicle-to-vehicle communication which — if hacked by terrorists — could cause carnage. Cyber experts routinely talk of “ransomware” attacks in which driverless cars will be hijacked, with a ransom demanded to avert disaster. But I for one think that the pros far outweigh the cons, and what’s truly exciting is that we aren’t even close to unlocking this technology’s full potential. Social media is a medium that is used by a vast number of people each and every day. Not only does it provide a global platform from which we can highlight important political issues and social concerns, but it also allows us to work and connect with people on the other side of the world in a matter of moments. However, whilst the considerable technological advancements that have been made over recent years have undoubtedly brought many benefits, there are those who think that it has also had other less desirable effects. Some argue that rather than bringing people together, it is actually driving communities and families further apart, as the younger generation especially appear to become increasingly consumed in their digital lives. Although such concerns are understandable, I think that they are also somewhat short-sighted. Because social media, if embraced and used responsibly, is one of the most powerful tools that we have at our disposal for connecting with our children, uniting the communities in which we live and most importantly increasing our level of social impact. Social media sites like Facebook and Twitter and messenger apps such as WhatsApp have allowed us to considerably increase our social impact. They enable my wife and I to connect with the children that we ‘adopt and educate’ through the Zenises Foundation in ways that wouldn’t have been possible even a decade ago. Through social media, we are able to communicate directly with these children at any time and from any place in the world. It gives us an invaluable insight into how they think, feel and relate to the world around them. And it is this insight that enables us to support and guide them more effectively on a real time basis. This increased level of global connectivity enables them to develop their skills and confidence because they know that they can reach out to us at any time and that we will respond. Through the simple act of following my wife and I on social media, these children now feel as much a part of our lives as we do theirs. These are children who could not even speak English a few years ago, and yet through the power of social media, they are now able to ‘friend’ us and ‘poke’ us on Facebook! So it’s clear that this innate desire to connect has only served to fuel their education further. More importantly, it also allows these children to communicate amongst themselves and build their own communities and support networks. Recently when we were in India meeting with the children, we found that the older children had taken the initiative to set up a Facebook group to interact and keep each other abreast of developments in their schools and personal lives. Even more pertinently, they also used this network to inform each other of the various job opportunities and training available. We couldn’t help but feel overwhelmingly proud to see this network effect of social media that the children themselves had come up with in order to provide support to one other. Another way in which social media benefits communities is that it enables businesses to spread the message about the philanthropic work that they’re doing. In doing this, companies can inspire others to increase their own efforts, and thus the actions of one business creates a stronger incentive for all businesses to adopt more socially responsible business practices. And just as importantly, businesses can harness the power of social networking to unite with other like-minded companies and organisations, which allows them to increase their social impact even further. I recently had some first-hand experience of this when I happened to see a post on Facebook and discovered that an acquaintance of mine was working in India helping to provide education to disadvantaged children, in an initiative that seemed to share similar objectives to the Zenises Foundation. What I saw was that they were using innovative applications of technology to further reduce the cost of education in rural India. Upon learning of this fact, I decided to use this as an opportunity to connect with them through social media, and together, we helped to implement some of their educational programmes and introduce new and innovative technology into the existing curriculum. So, if a small company like Zenises can utilise social media to inspire others and affect positive societal change through initiatives such as Z Aspire and T OutReach, then why aren’t more companies doing the same? A recent article in the New York Times described social media as being a “public space of seemingly limitless potential in which we can find common ground with total strangers and our closest friends, making progress towards solutions to our world’s crises”, and I am inclined to agree. I see the prevalence of social media as being representative of the absolute hunger that people have to connect with each other. Therefore, by choosing to embrace this most revolutionary of technologies, we are choosing to connect with other businesses, our children, our communities and the world at large on a purposeful and meaningful level. And in becoming more connected with those around us, we can achieve greater social impact on an individual, local and global scale. 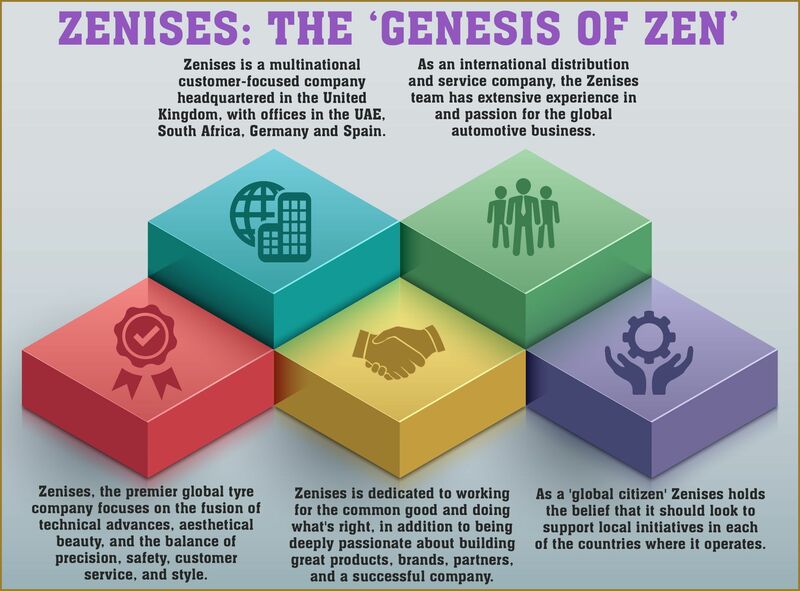 In this article you will learn about Zenises’ Z tyre brand…..
New Brand – When was Z tyre introduced and what made it unique? Design – What aspects of Z tyre’s design contribute to its performance? Testing – How did the Z tyre hold up under testing? Innovation – What are the latest Z tyre products? Z tyre is a cost-effective, premium tyre brand that was first introduce to the European scene in 2014. It combines all the best aspects of luxury high performance brands into an affordable, quality tyre and has quickly become a favourite with European drivers. Z tyre was born out of a collaboration between the two great cities London and Dubai, representing the best aspects of old and new luxury. It was tested and designed with the challenges of European roads in mind, making it one of the safest tyres in all types of driving conditions. The multinational tyre corporation, Zenises Group, is the company behind the Z tyre brand. Founded by CEO and experienced entrepreneur, Harjeev Kandhari, Zenises has been pushing the boundaries of the industry since its inception and now has a presence in thirty different countries. As well as being an innovative business leader, Harjeev Kandhari is passionate about the industry. He began working with tyre design in his family’s company in Dubai, so with Zenises, he knew right away he wanted a brand that would accurately represent the company name. In all aspects except the price, Z tyre is premium high performance tyre geared toward drivers that expect the most. Speed ratings, the measure of how well the car handles at top speed, go all the way up to Y (300 km per hour) on the Z tyre even though most tyres stop at W (270 km per hour). At the same time Z safety and economy ratings are also impeccable with a consistent B level wetgrip in all tyres and a B or C in fuel efficiency depending on the tyre size. These are some of the features which helped to make the original Z tyre design so versatile and revolutionary. Modern Tread Design – the special tread pattern maximises contact with the road. The wide central rib running all the way around the tyre allows for greater stability at high speeds while the contour of the shoulder conforms to the road for optimal handling and high precision driving. Asymmetric Tread Pattern – the inside and the outside of the tyre serve different purposes in Z tyre, so they are not designed the same. The inner edge reduces wear and allows for maximum wetgrip performance. Meanwhile the outer rim provides the high performance that discerning drivers expect, with easy steering and a comfortable smooth ride even on the narrow winding roads of Europe. Deep grooves – four deep troughs running around the entire circumference of the tyre help to trap and eliminate water. This reduces the tendency to aquaplane, even in lightweight vehicles, and supports Z tyre’s excellent wetgrip rating. Silica based compound – the tread compound is another important factor in wet and dry breaking. High silica content in the Z tyre’s surface means that slick roads are no longer a problem. Tread wear indicator – this lets the driver know when the tread level is becoming unsafe and it’s time to replace the tyre. The Z tyre was the result of knowledge, years of experience and careful design. However even the most expert tyre design needs extensive testing to make it one hundred percent road worthy. Every Z tyre has to pass the Z 360 ⁰ testing criteria to make it worthy of the Z logo. Zenises wants to make sure Z tyres conform to the most objective standards, so testing is carried out by an independent agency, Total Performance Testing, in Idiada Spain. Chris Davidson was part of the team that helped to evaluate the Z tyre. According the Davidson, a high performance tyre like Z tyre should have excellent handling and breaking power at top speed. ‘The sidewall stability is the key thing with this type of tyre.’ Davidson helped conduct a ‘full suite of wet and dry tests’ on the Z tyre in and found the tyre matched very well with top tier companies in both performance and safety. Z tyre has proved that premium tyres don’t need to come from the top brand names, or cost a fortune. Harjeev Kandhari didn’t stop with the creation of a state of the art tyre. The Z tyre brand has continued to expand, adding several new product lines in recent years. The Z 1 flat tyre allows drivers to control the vehicle and continue driving safely for a short period of time even with a significant drop in tyre pressure. In the event of a flat, you’ll be able to get to a safe location where someone can help you, instead of being stranded at the side of the road. The Z tyre range also includes SUV sizes, and winter and all season treads will be coming to the Z family soon. The latest Z innovation available in Germany is a Flat Rate Tyre Subscription which can help to avoid the high up-front cost of purchasing new tyres. For a monthly charge of 4.99 euros, customers are guaranteed all the ‘tyre-related services’ they need. This helps to ensure a long term relationship between the customer and their tyre-professional, but more importantly it promotes driver safety. With the new Z contract, tyres will automatically be replaced once the tread drops below a safe level; drivers don’t even need to worry about checking. This is an important concern, since a recent safety report found that more than a quarter of the cars on the road have tyres that are below legal tread requirements. Z tyres new subscription is just one of the many changes Zenises has brought to the tyre industry, helping to make tyres safer and more economically efficient for customers.